Your family will hop out of bed for these breakfast pancakes. We've pumped up the flavour with brown sugar and cinnamon. Mix first 5 ingredients in medium bowl. Whisk egg, milk and margarine until well blended. Add to dry ingredients; stir just until blended. Let stand 5 min. Heat large skillet sprayed with cooking spray on medium heat. 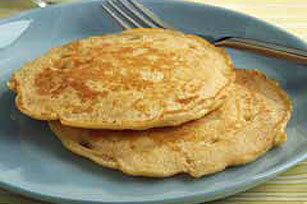 Ladle scant 1/4 cup batter into skillet for each pancake; cook 2 to 3 min. or until bubbles form on tops, then turn over to brown other sides. Make sure the skillet is hot before using. Flick a few drops of water on the surface - if the water sizzles, the skillet is ready. Stir 1 cup blueberries into the batter before ladling into hot skillet.